FAQ: Why Air Drying Instead of Vacuuming or Wiping? Why do CleanerVinyl ultrasonic vinyl record cleaning products use air drying instead of wiping or vacuuming? It is touch-less. Wipes and vacuum wands come in direct mechanical contact with the record surface and introduce micro-scratches, essentially negating one of the major benefits of ultrasonic record cleaning: It is touch-free and ultra low impact! Air drying can be used directly on the spinning record stack without the need for handling them in wet condition. Just move the motor unit into the drying position and turn on the fan. 25 min later remove the records and put them back into the sleeves. Never touch a wet record! It does not introduce static charges on the vinyl surface. Objects are not charged by the surrounding air, but rather by contact with other objects resulting in charge transfer between the objects. Therefore, mechanical contact with wands or wipes causes charge transfer from or to the records, causing the development of static charges on the vinyl surface. Hence, wiping essentially negates one of the main benefits of ultrasonic cleaning where charges are effectively removed from the vinyl during contact with the cleaning fluid. It does not introduce new contamination. 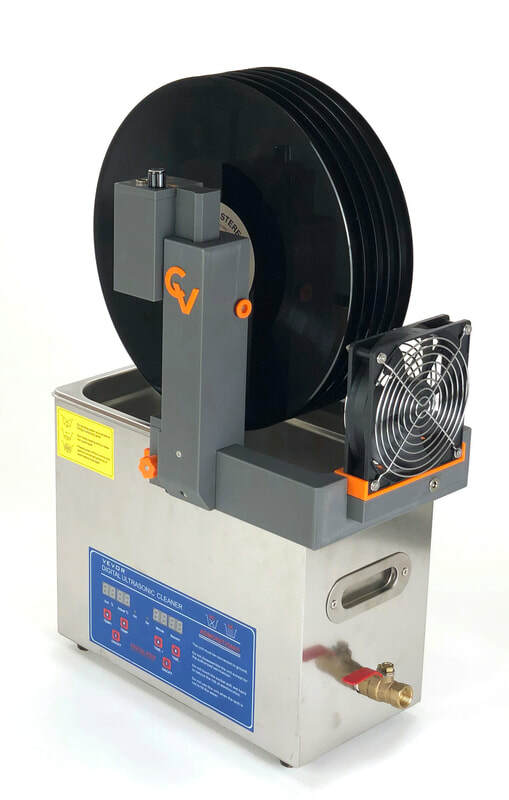 Since the records are free of charge after the ultrasonic cleaning process, dust in the air is unlikely to be attracted and will simply 'blow by' in the air stream. In contrast, wipes and wands frequently contain dust and lint, which can be transferred to the vinyl surface during their application. CleanerVinyl Easy6 in 'drying mode'. The records are removed from the fluid. The integrated fan dries them in about 25 min. Never touch a wet record!